Safe to post this card now. I find making cards for my nearest and dearest so hard, they never seem good enough. For this one I tried a different approach and didn't agonise over it for days - just went for it. Him indoors loved it, so my new approach must have worked! 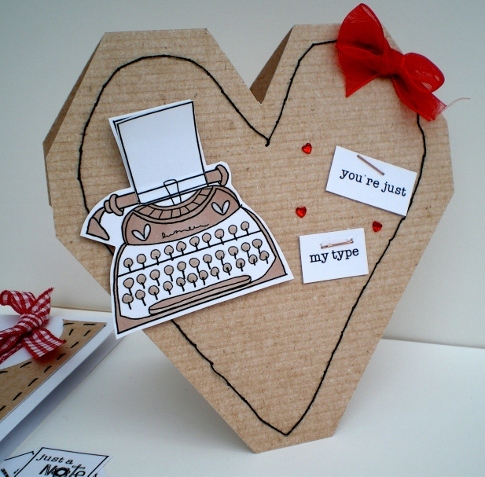 I've used the fabulous new digi stamp from Pink Petticoat - Quirky Qwerty, you get this lovely typewriter image and lots of sentiments to cut out and stick. There'll be lots of ideas and inspiration from the Creative Team over on the Blog this week. Another favourtie of mine is the Organics Kraft Pack, 7 different shades and textures of Kraft. For some added texture I've printed the Kraft onto ribbed card. I'm entering it for the monthly challenge over at Samuel Taylor's blog (thanks for the link Terrie). There's a chance to win some Copic markers and the theme is simple. "Copic Chic/ Promarker Gal" - so anything coloured with those pens goes! I've coloured the typewriter quite simply with a 'Tan' Promarker. I really must learn how to do the shading thing! I created a card for him indoors agonised over it!!! !like you do! but when I sent the card I couldnt remember which one he wasnt keen on..are you still with me..lol..
Anyways I sent him the one I agonised over!!!!lol.. oops ,but hes fine and loves it anyway! Maybe Ill buy a shop one next Year!!! Sorry to rant on there I couldnt help but share that with you!!! Great shape... great card and very different from the norm - Love it! Fab card Vicky, love the shape, image and how you've stapled the sentiment on. I just love this Vicky, really trendy! Pink Petticoat Inspiration Blog Hop!